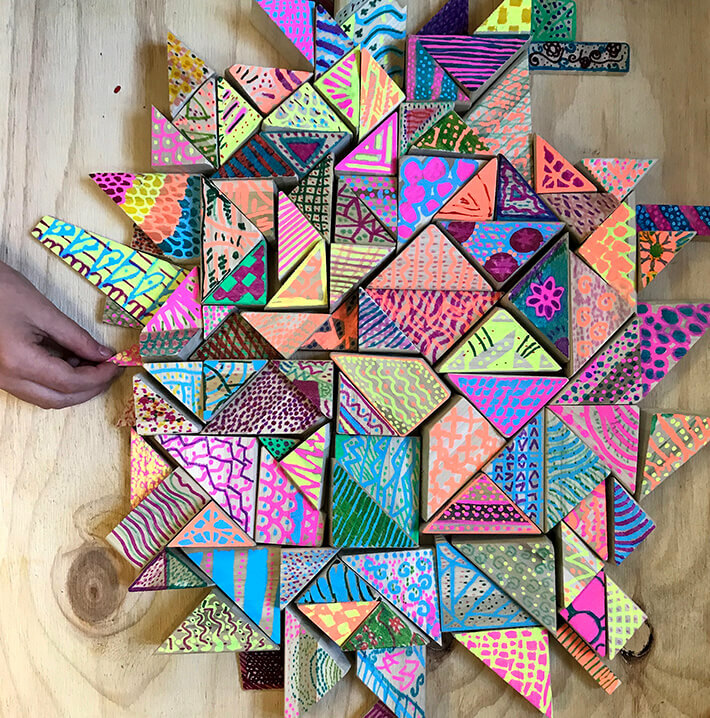 An easy sculpture project using wood scraps that’s fun to make for kids of all ages – by Danielle Falk of Little Ginger Studio. When I saw the giant tub of timber offcuts at my local creative reuse co-op (Reverse Garbage) in Sydney, I knew I had to have a sackful! I didn’t have a clue what my students and I would make but I wanted to get my hands on some. The tactile quality and lovely natural smell of raw pine was too hard to resist. If only I’d been greedier and bought twice as much! We loved this project so much I plan to buy planks of wood and cut them specifically for this activity next time. What will kids gain from working in wood? There is something very therapeutic about working with wood. 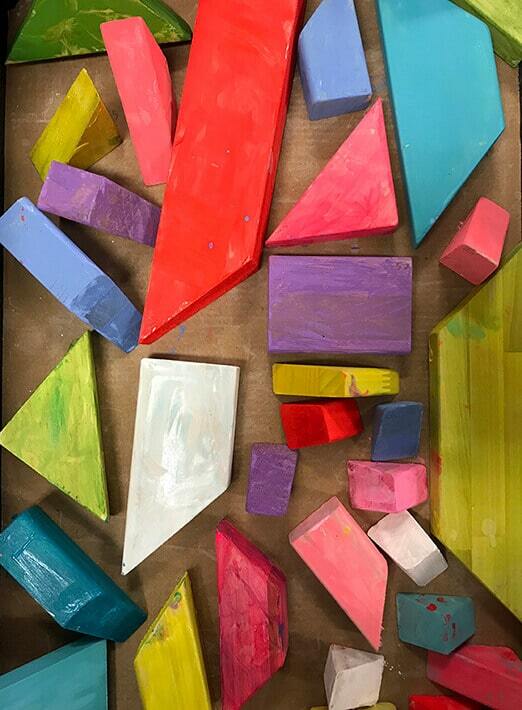 My students (ages 5-12) really enjoyed lovingly sanding their wood blocks to smoothed perfection! Students learned to create balanced compositions in three dimensions and looked carefully at each side of their work. They also gained a an understanding of using a bigger base to hold up smaller pieces (basic engineering!). RAW pine offcuts (may be available from your local hardware store. (Be sure to avoid treated pine as it is toxic.) of different sizes. Get a larger size for the base block and smaller blocks for the rest. We had a selection of mostly triangular shapes to work with. water-based varnish for sealing or just use matte Mod Podge! Put on a dust mask and carefully sand all the edges & corners to ensure there are no bits sticking out to cause splinters. I’ll say it again – kids really enjoy sanding. It’s a mystery why! After sanding, paint each block all over in one color. You may choose to leave a few blocks natural as a contrast. Once the paint is completely dry, use chalk or paint markers to draw neat but simple patterns in contrasting colors. We alternated our colors & patterns on different block faces but there are really no rules here! Tip: Don’t draw patterns on any rough-cut surfaces as your markers will be ruined! 3. Create beautiful wood block sculptures! I think you’ll agree that these simple, but satisfying sculptures are pretty easy on the eye! My students were thoroughly engrossed in this activity. They spent a long time “playing” with their blocks–arranging and rearranging their compositions. I gave them the option of gluing their work together into a final sculpture OR taking their work home as a set of building blocks. It may be a good idea to seal the blocks with a layer of varnish or Mod Podge if you wish to do this. This activity could also be adapted to create relief sculptures stuck to plywood to hang on the wall. Danielle Falk, from Little Ginger Studio, is an Art Educator from Sydney, Australia. She has a background in Primary (Elementary) Education, is a cardboard hoarder, and loves any fluorescent art supply.Her business name, “Little Ginger Studio,” is named after her daughter (who hopefully will forgive her mum in time).She started her Children’s Art School nine years ago when she realized many students lacked adequate opportunities for creativity in the day-to-day curriculum.Little Ginger Studio hosts after-school visual arts programs that explore all manner of making, as well as exciting school holiday (vacation) workshops with a focus on big, messy creativity & contemporary crafts.Danielle loves nothing more than letting children of all ages loose on a pile of shiny new (or recycled!) art materials and watching their creativity ignite. Oh I love this. So creative! My youngest would love this.